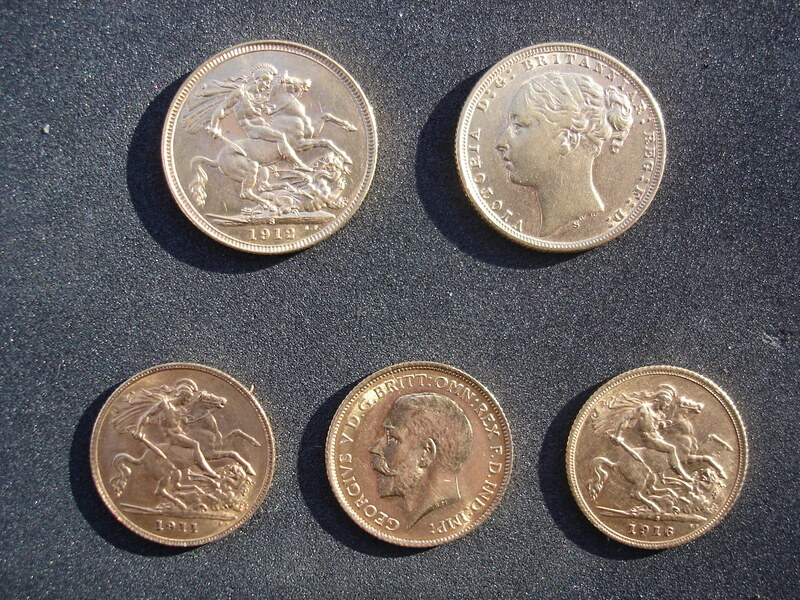 Gold sovereigns as we know them today have been produced by the Royal Mint in Britain and other parts of the old British Empire since 1817. (So you can also buy sovereigns made in Canada, South Africa, Australia and India). These coins were made for circulation, and produced for actual use as coinage by the Royal Mint until the First World war, and by the other mints until the early 1930s. Sovereign production began again in 1957, but this time not for the purpose of circulation, but as bullion and for collectors. The full sovereign is 22mm in diameter, weighs 7.98 grams, and has an actual gold content of 7.315 grams (0.2354 ounces). For a rough price check on coins for sale, remember that a full sovereign contains a bit less than a quarter ounce of gold. The half sovereign is 19.3mm in diameter, weighs 3.99 grams and has an actual gold content of 3.657 grams (0.1177 ounces). On many auction sites sellers will describe a coin as a ‘sovereign’ when it is actually a half sovereign, so always ask about the weight or diameter of the coin if in doubt. Honest dealers and sellers will specify ‘full sovereign’ or ‘half sovereign’ in the title of the auction. Sovereigns always have the relevant monarch on the obverse, and St George and the dragon, or a royal shield on the reverse. While the 20th century sovereigns can often be bought for close to bullion value, the earlier sovereigns, especially those in Very Fine condition or above, will have a numismatic or collector premium of 15% or more.